What does tummy tuck do? Before knowing the price you have to pay for abdominoplasty, let us know what it can do for your body. Most mothers have this – flabby, excess skin after pregnancy, nasty stretch marks, and weakened abdominal muscles after giving birth. Some tried to exercise and lose the pregnancy weight, but some stubborn fat and stretched out skin still remain. So they do the next best thing and that is to inquire about a tummy tuck. A tummy tuck or abdominoplasty can remove that excess skin and fat in the belly, thus eliminating the stretch marks as well. Undergoing this surgical procedure also tightens weakened or separated abdominal muscles and recreates your slender, more contoured waist and belly. Anyone who has a problem with their flabby tummy turns to abdominoplasty, so this procedure has evolved, and different methods are now being utilised to address everyone’s belly issues. A standard or full tummy tuck is the most common type of abdominoplasty that addresses the whole abdominal area. The plastic surgeon creates an incision below the bikini line from hip to hip, then removes the excess skin, fat, and tissues of the abdomen. He then stitches separated abdominal muscles together and repositions the belly button to accommodate the new form of the tummy. Full tummy tuck cost can range from $9000 to $15000 in Australia. Liposuction is also a procedure that can partner up with this surgery, so expect a higher price when the plastic surgeon combines them in one setting. A mini tummy tuck addresses excess lower abdominal skin and fat. 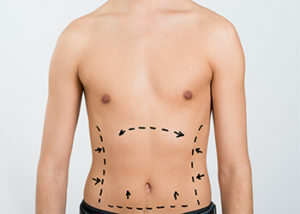 It is less complicated than the full tummy tuck since only the lower abdominal area is treated. This kind of tummy tuck costs about $4000 to $8000 in Australia. Will my health insurance cover my tummy tuck cost? Due to changes in the criteria for coverage and rebates are still in the process for Medicare and other health insurance providers, your tummy tuck cost may or may not be covered as of this time. Medicare awards rebates for this procedure under strict guidelines that the patient should have significant weight loss (more than 5 BMI), has maintained a stable weight for at least 6 months, has been experiencing daily activity limitations because of abdominal discomfort, and has developed skin irritations around the abdomen, indicating that tummy tuck surgery is a necessity. With this information on hand, inquiring about tummy tuck cost from known plastic surgeons or cosmetic surgery clinics can now be less of a worry since you have a general idea of how much it would be priced. However, these are just price estimates, and with the upcoming changes with the Medicare guidelines about abdominoplasty coverage, it is still best to consult your chosen plastic surgeon to know the exact tummy tuck cost.